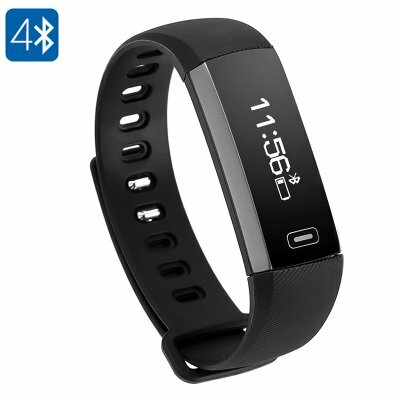 Successfully Added Fitness Tracker Bracelet M2 - Pedometer, Heart Rate Monitor, Sleeping Monitor, Calorie Counter, IP67, Touch Button (Black) to your Shopping Cart. Supporting Bluetooth 4.0, this sports watch can be efficiently paired with both iOS and Android smartphones. When used with the dedicated mobile Application, this Bluetooth watch will provide you with highly accurate workout reports and allow you to analyze your previous exercise sessions as well as your development over a certain period of time. Its highly accurate pedometer keeps track of the distance you cover during your workout and calories burned while its heart rate monitor keeps you constantly up to date about your current heart rate levels. Having all this valuable information at your disposal allows you to fully adjust your upcoming workouts to your own personal capabilities – letting you reach your fitness goals in up to no time. To make sure that you’ll always get enough rest in between your demanding workout sessions, this fitness band features a sophisticated sleep monitor and alarm clock. From now on you can be assured that you’ll always get the needed relaxation, ensuring that your muscles recover fast and you’ll be able to reach your targets in the fastest and most efficient manner. Its alarm clock furthermore ensures that you’ll never oversleep or miss an important appointment again. When paired with your smartphone, this fitness tracker keeps you also updated about incoming messages and phone calls – assuring that you’ll never miss an important notification again. Its high-end 0.86-Ich OLED touch screen keeps you constantly informed about the time and current health status, and additionally lets you efficiently switch in between the watch’s different features – bringing along a smooth and highly efficient user experience that is guaranteed to meet all your fitness and everyday life requirements. This Bluetooth fitness band comes with a 12 months warranty, brought to you by the leader in electronic devices as well as wholesale electronic gadgets..